Pro-Ject DAC Box USB review | What Hi-Fi? The flurry of affordable digital-to-analogue convertors continues apace. Suddenly we're all spoiled for choice. Here it's established turntable guru Pro-Ject's turn to attempt to turn our heads.Even by prevailing standards, the DAC Box USB is a tiddler at just 4x10x10cm. At the back there's just about room for a single digital optical input, one digital coaxial input and a ‘mini-A' type USB input. At the front is a button to select input and a blue power-light. Realistically, that's all the majority of users will need. Attached to an Apple MacBook via HDMI and with a WAV file of The Waterboys' Fisherman's Blues playing, the Pro-Ject gives a decent account of itself. It's certainly not short of low-frequency presence, the acoustic bass-line granted weight and good tonal variance – it lacks a little of the out-and-out punch of some competitors, but it's well judged all the same. The midrange is spacious enough to give a singer some room to breathe (though it doesn't extract sufficient fine detail to be absolutely explicit) and treble is bright without becoming splashy. All of this information is integrated without the seams showing. It's a similar story when converting a CD. This gives a clean and controlled listen, with a happy disinclination to overemphasise any part of the frequency range. But it's not quite as fluent as we'd like when moving through testing rhythms and tempos, and music that should be sinuous can be rendered a little square-edged and lumpy. 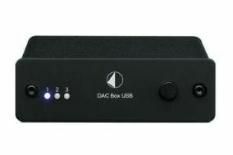 There's currently plenty of choice in the budget-DAC market, and the DAC Box USB is a diverting alternative if not an obvious front-runner.